A mash-up of sorts, 2015 Upper Deck Marvel Dossier is an eclectic low-end release that features traditional cards and collectible dog tags in one product. 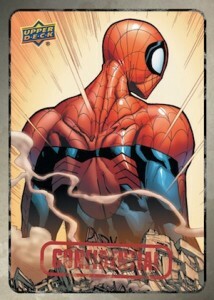 Part basic card set and part wearable collecting option, Upper Deck Marvel Dossier walks the line between the two choices. Each pack yields two base cards from the 55-card set. There are also Foil parallels that average one per pack. Although there are no card inserts of any kind, collectors can find one Dog Tag with a necklace chain in every pack. With a total of 55 subjects, there is also a chase aspect as 15 of the dog tag characters are short prints. Despite this apparent variety, one thing collectors won't find is premium hit options typically found in UD Marvel products, like sketches, autographs or relics.